Advocate Geoff Budlender, representing Black Sash, said former Minister of Social Development Bathabile Dlamini wanted to “avoid personal liability” by “lying” to the Constitutional Court. This was heard in the closing arguments of an inquiry into Dlamini’s personal role in the social grants crisis. The inquiry was ordered by the Constitutional Court last year and the closing arguments took place at the Office of the Chief Justice in Midrand on Monday. Budlender was referring to the so-called work streams Dlamini established. These workstreams were the teams that were supposed to work on getting Sassa (South African Social Security Agency) to take over the payment of social grants from a private company called CPS (Cash Paymaster Services). The Constitutional Court found that the contract with CPS was unlawful, but granted an extension of the contract so that the payments to social grant beneficiaries would not be interrupted. However, the Constitutional Court also ordered Dlamini to show why she should not “pay the costs of the application out of her own pocket”. This inquiry will make recommendations to the Constitutional Court on whether Dlamini should be held personally liable for the costs. Retired Judge Bernard Ngoepe chaired the inquiry. He has to determine whether Dlamini appointed people to lead the work streams who would report directly to her instead of Sassa Chief Executive Officer. Ngoepe also has to consider why Dlamini (now Minister of Women in the Presidency) did not disclose this information to the court. Budlender said Ngoepe should find that Dlamini “acted in bad faith” by “lying” about her role in the workstreams. He said Dlamini claimed that the work streams reported to the Sassa Executive Committee and not directly to her, but there was “overwhelming evidence” which contradicted her version. He said Dlamini “lied” about the work streams because they were an “expensive and unlawful fiasco”. “She knew the Constitutional Court might say that you’re the person responsible. So in order to avoid potential liability of cost, she obscured — in fact lied — about her role in the work streams,” said Budlender. 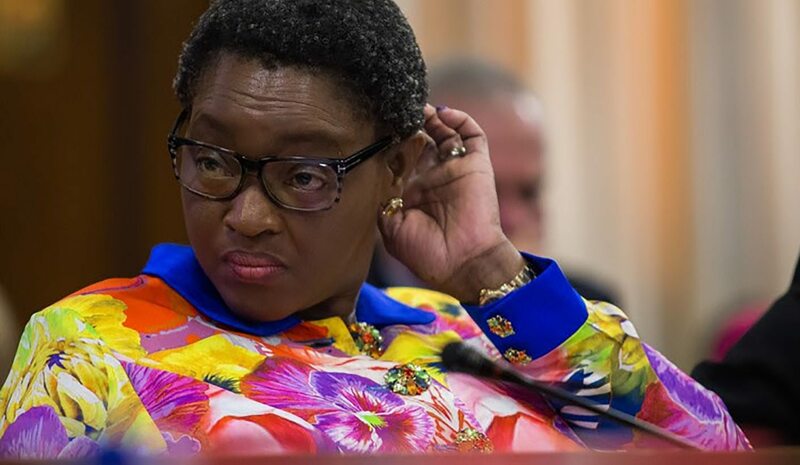 He said Dlamini could not produce one document which showed that the workstreams reported to the Sassa executive, and not directly to her, as she claimed. “The inescapable truth … is that when the minister told the inquiry that the work streams reported to (the executive) and not her, that was not the truth and she knew it was not the truth because the documents and the facts did not support her,” said Budlender. Advocate Ishmael Semenya, representing Dlamini, said Dlamini did not tell the court about her role in the workstreams because her affidavit only required her to answer two questions, why she should not be joined as a party and why she should not be liable to pay the costs. He said Dlamini did not think it was necessary to go beyond those two questions. He also said there could not have been a “conscious effort” by Dlamini to hide the work streams because she announced it openly in 2014. He reminded Ngoepe that the inquiry was a factual inquiry and not one that could make Dlamini pay the costs. He warned Ngoepe against making comparisons between facts of the case and the opinions of the other parties. He said the other parties were speculating about the reasons for Dlamini’s actions, which was not the purpose of the inquiry. “Some are saying she was trying to avoid cost and others are saying she was trying to maintain her reputation, but how far do those speculations go? This is a factual inquiry, we should be comparing one version with another and not make inferences as to why the minister acted in a certain way,” Semenya told Ngoepe. “You are really trying to circumscribe (limit) too much,” replied Ngoepe. He said although he could not make a ruling on whether Dlamini should be held liable for the costs, he would not refrain from making a “credibility finding” which would tell the Constitutional Court if he thought a witness was lying.